Anti-social behaviour by teenagers which was blighting two villages in Flintshire is on the decline thanks to Friday night football sessions funded by Wales & West Housing. Following growing reports of young people committing criminal damage, playing football on business premises and throwing eggs at vehicles in Ewloe and Hawarden, we stepped in to support the solution devised by North Wales Police and Flintshire Council to tackle the problem. 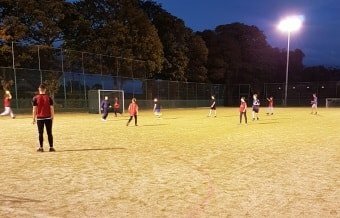 More than 20 youngsters aged 12-17 now attend a weekly football session at Hawarden High School run by police community support officer (PCSO) Stephanie Jones and Dan Williams, school and community sports coordinator from Aura Leisure and Libraries. Many of the anti-social behaviour suspects blamed their actions on boredom and having nothing to do after school. But with the regular activity in place since September last year ASB crime in Ewloe and Hawarden is declining – and relations between the police and young people are on the way up. “Myself and Dan both felt that Hawarden and Ewloe were lacking positive activities that could be utilised by local young people to entertain their time more constructively outside of school. Wales & West Housing generously provided £500 of the £750 raised to support the programme, with the rest provided by Flintshire County Council’s ASB tasking committee and Aura Leisure and Libraries. The football sessions have definitely had a positive impact on the levels of Anti-Social Behaviour in the area, particularly on Friday evenings. “On some of the busiest weeks as many as 50 have attended to take part, which is fantastic.